I AM CONTINUOUSLY COMPLAINING BY EMAIL, PHONE & WRITTEN APPLICATION FOR ONGOING UNAUTHORISED CONSTRUCTION OF 151/8, BANIA WARA BALLABGARH. BUT NO FEEDBACK, NO REPLY & NO POSITIVE ACTION TAKEN FROM MCF SIDE AS UNAUTHORISED WORK IS CONTINUOUSLY GOING ON VERY SPEEDLY EVEN IN NIGHT ALSO. EVEN MCF HAS REPLIED AGAINST RTI VIA MEMO NO. MCF/AE(B)/RTI/2014/133 DATED 18.07.14 & MCF/AE(B)/RTI/2014/106 DATED 04.07.14 THAT HE IS DOING UNAUTHORISED CONSTRUCTION WITHOUT ANY APPROVED BUILDING PLAN.I also lodge my grievance on mcf website with Grievance/complaint ID 21439. When I check status of your complaint option it shows server error. If this unauthorized construction is not stopped immediately, it will encourage others to follow the same practice. SO YOU ARE REQUESTED TO TAKE ACTION ON IMMEDIATE BASIS. As scheduled and discussed, action will be immediately initiated once we have inspected all the documents. Regards & Jai Hind! Please file a complaint at the CM Window, in Sec-12 in person with copies of all communication with the MCF. Dear SIr, I want to lodge a complaint in the environment department of faridabad..kindly show me the way to do it.. Please click the last link which says “ALL OTHER COMPLAINTS” where the harsamadhan form will open up and in the dropdown box there you may choose to complaint to the ‘Administrative Secretary- Environment’ or to the Deputy Commissioner, Faridabad. I have registered a complaint in M.C.F. and Environment Department through your website. Its been more than 20 working days, but no action has been taken and we are waiting to hear something from the officials. 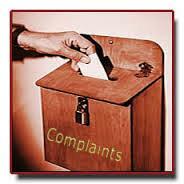 Kindly tell us how to track our complaint and what other actions we can take regarding our complaint. My complaint numbers are 22088 in M.C.F. and FCENV/E/2014/00003 in Environment Department. Kindly show us the way.